Your e-mails, letters, cards and prayers meant much to me. They reminded me in a most moving way just how fortunate I am. Even though intellectually we know that breast cancer is not necessarily the death knell it once was, cancer is still a frightening word to hear. But I cannot say I felt fear. I didn’t. But I saw fear in the eyes of others. The hardest part was sharing the news with our children. Especially emotional for me was telling our daughter. She lives in South Korea so the news came to her via e-mail. As a woman, I am very aware that “Is there any history of breast cancer in your family?” is a frequent question asked at medical appointments. Now Jillian’s answer would forever be “Yes. My mother.” I’ve wanted to pass on much to our children — a possible pre-disposition to cancer was definitely not on the list. I was prepared mentally and physically for the July 15th surgery. I approached the operation as an athletic event much like I approached the birth of our three children. When I learned I was “with cancer,” I increased my physical exercise, improved my eating habits and worked on educating myself about what was to come. I do not think I increased my time with God — happily, we already have quite a bit of such time here at Koinonia — but my awareness and intentionality during those times were heightened. And something happened. Outward signs began to match what I was feeling interiorly. The outpouring of love from my community, family, friends, interns, former interns and guests filled me. Prayer works. Whether the specifics of the prayer come to pass or not does not matter. As the recipient of your prayers, I felt what I think it must feel like to be a child held tenderly. Between surgery and the start of radiation treatments, I came back home to the farm. 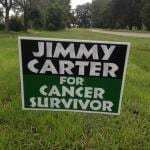 On a drive through the countryside, I passed a series of yard signs that read “Jimmy Carter for Cancer Survivor.” In less than 24 hours after President Carter’s press conference announcing his cancer diagnosis, dozens of these signs appeared throughout our area (Plains is only seven miles away) and they are still there. All proceeds from their sale go to cancer research. There is one such sign at the entrance to Koinonia Farm. Like so many who watched that press conference, I was touched by Jimmy Carter’s words, smile, spirit and humility. I loved the laughter his humor evoked. Most of all the peace he emanated affirmed the peace I was feeling. A few months later, with radiation treatments completed, I prepared to travel from Texas back to the farm. I stopped by to see my niece before getting on the road. She was a patient in M.D. Anderson Hospital having battled stage 4 colon cancer for three years. I left Houston on Sunday. She died on Monday. I didn’t expect that. I was cancer free. Jimmy Carter had announced the same. My niece was 27. I thought about railing at God. But I thought of Stephanie and how she exemplified Eckhart’s sinking into God. Pray for Stephanie Spates Soria and her family. Pray for President Carter. Pray for me. Pray for our world. I pray for you. It matters.